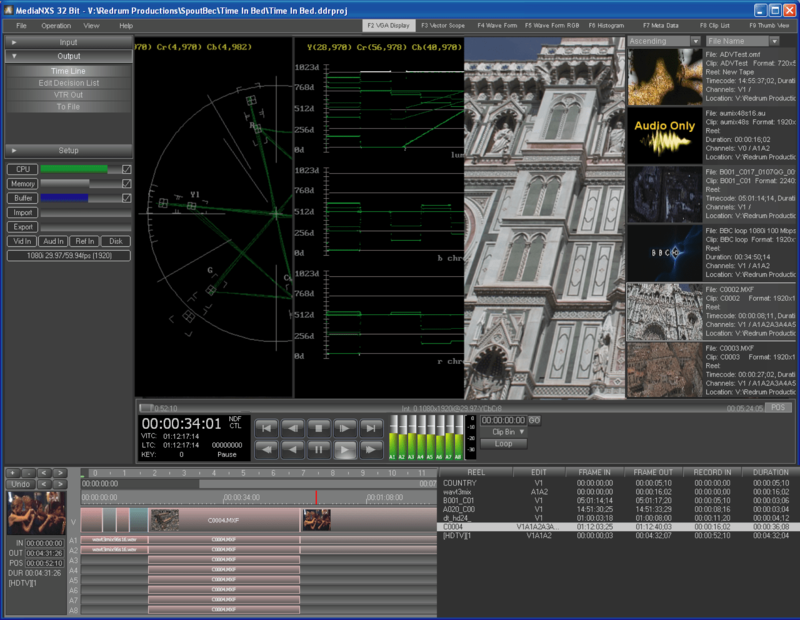 MediaNXS software provides a bridge between the digital intermediate workflow and the real world. User directed, time of day, or set duration record directly to your preferred file type. Edit in Adobe Premiere or Avid Media Composer while still ingesting. Import existing files for playback. Create low resolution proxy files via export for logging and editing, and generate full resolution conforms for downstream processing and delivery. Maintain project-based media pools and settings. 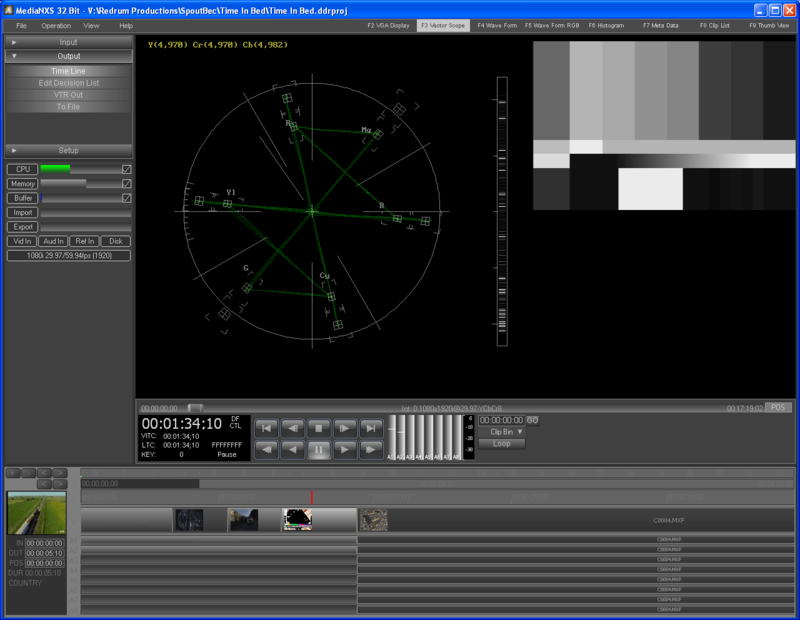 Output via Drastic's robust VGA preview for passthrough and output video plus a range of signal analysis tools (vectorscope, waveform monitor, and histogram), with built in metadata display. 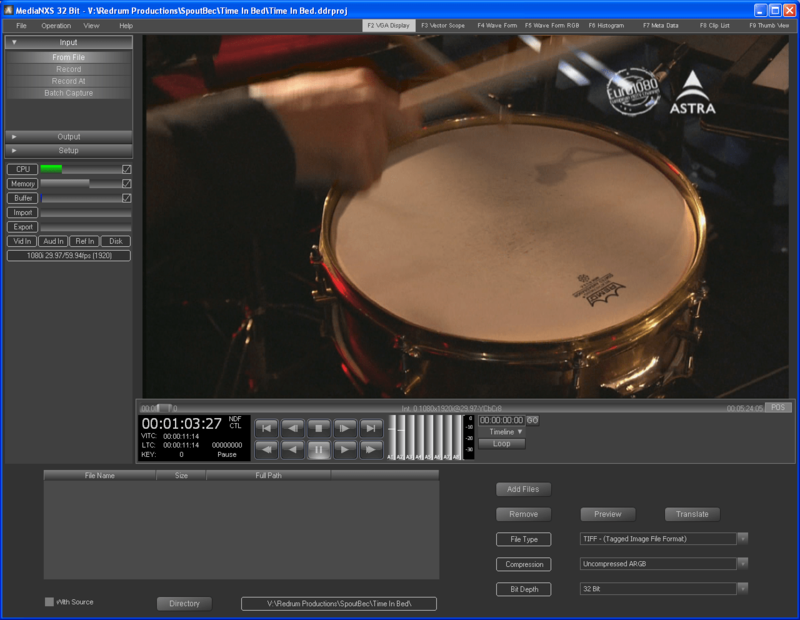 MediaNXS provides a variety of recording methods and settings. For on set use, self incrementing shot and take numbers can be embedded into each record file and its metadata. Records may be added to the timeline upon creation, either at a specific location or at the end of the last recorded clip. Records may be 'crash' records with user-directed record and stop controls, or using a set duration. Recordings may be set to occur at set intervals for a specified duration, including single frame recording for animation. Time of Day recordings may also be set up, using the system clock to automatically start the recording (and if desired a duration setting to end the recording). All recordings are made in their selected, native format. Any storage that provides enough speed and capacity can be used. 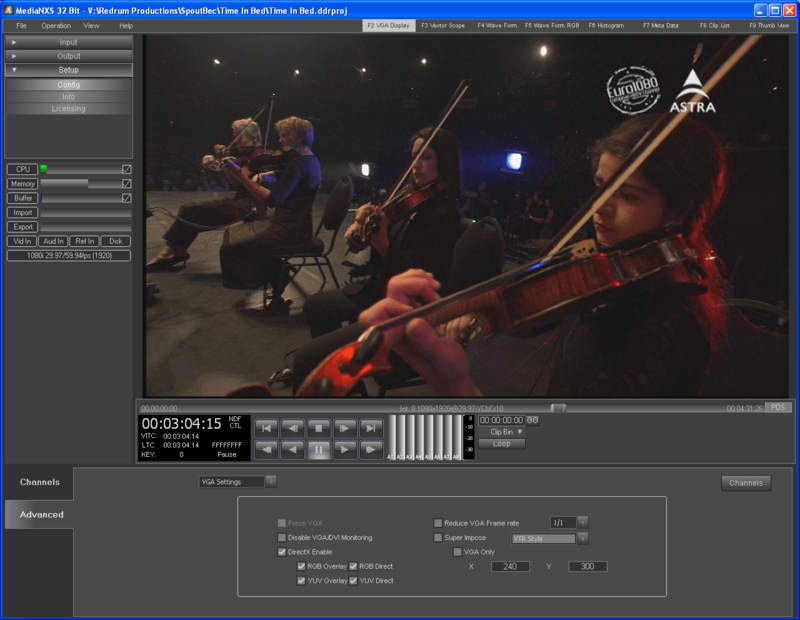 MXF files like XDCam, OP1a, DPP/AS-11 and HDF support Adobe Premiere native edit while ingest. Most other recording file types can also be edited during ingest in Premiere or Media Composer using the MediaReactor Workstation add on. MediaNXS includes selected components of Drastic's award winning MediaReactor file translation engine. This allows a wide variety of files that cannot be worked in real time, to be imported or exported to file formats that can. 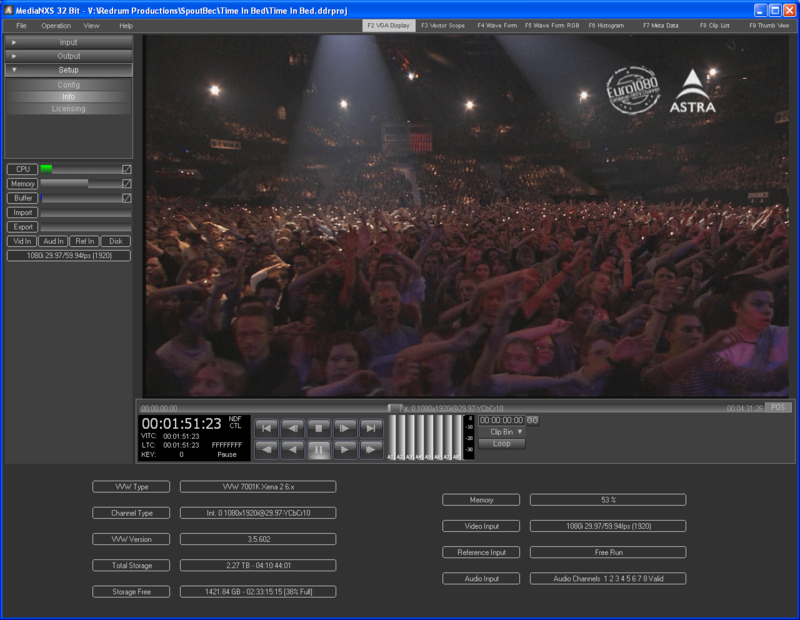 The new file will always be to one of the industry standard formats MediaNXS supports for native playback. Import creates a series of new files in the specified format, ready for review, delivery or display. The new files are added to the Clip Bin so they will appear in the Thumbs and Clip views. 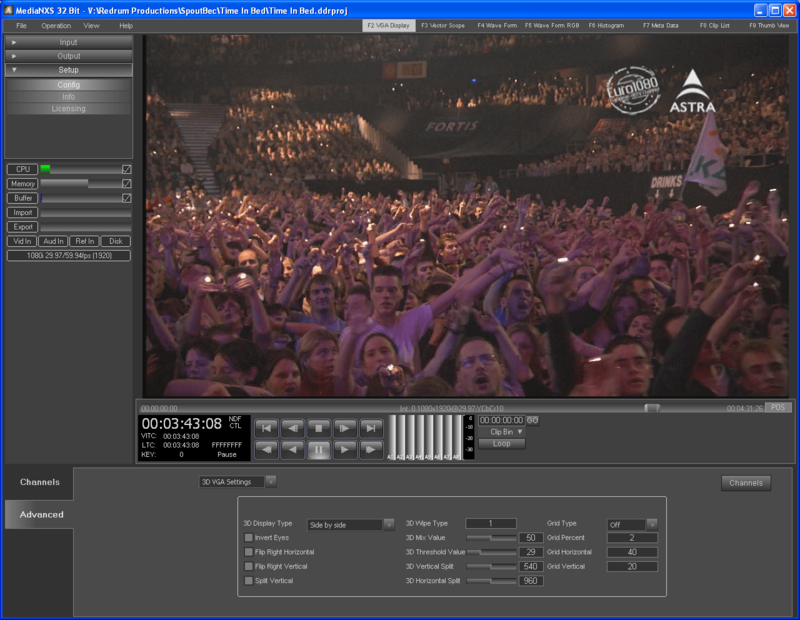 A Preview feature is offered to confirm the user has selected the right media (and a remove function if the clip does not need to be transcoded). Output to File uses the Timeline to select the media which will be transcoded. A dialog arises to let the user set the format for the conversion, and sets an In and Out point to specify the media which needs to be transcoded. Once the transcode is finished the resulting file will have media where there are clips, and black with silence where there are none. A Load and Save As dialog are present in the format setup to provide templates for the user's transcodes, so the user only has to set up the transcode once to use the same parameters at will. The template is also available to other MediaNXS stations if it can be accessed on a network. Each MediaNXS project features a "Clip Bin" that contains a selected subset of the files available to your system. These files can be displayed as a clip list or a series of thumbnails, limiting the amount of information that needs to be dealt with at one time. Full sorting capabilities make it easy to find your clips, even in very large clip bins. The Thumbs view provides a picon and identifying information about each clip, and offers dynamic features for the convenience of the user. Double clicking on the clip will load its details into an edit clip dialog. A right click option provides metadata display and edit options. You can add a clip to the Timeline or EDL by dragging and dropping. 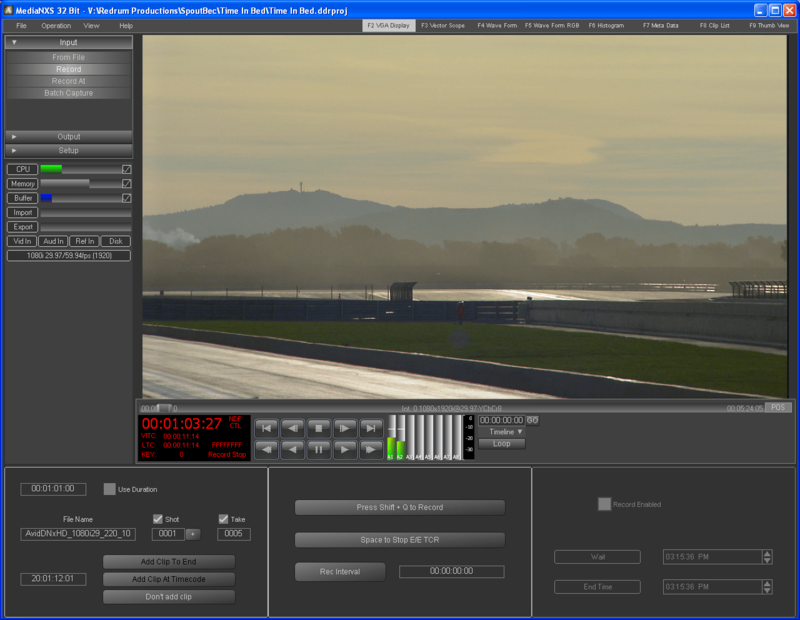 The Clips View provides more extensive clip details, and offers a number of controls to work with the clip. The media can be removed (simply taken off the list but maintained), deleted (moved to the trash bin) or edited (have its in/out points trimmed). 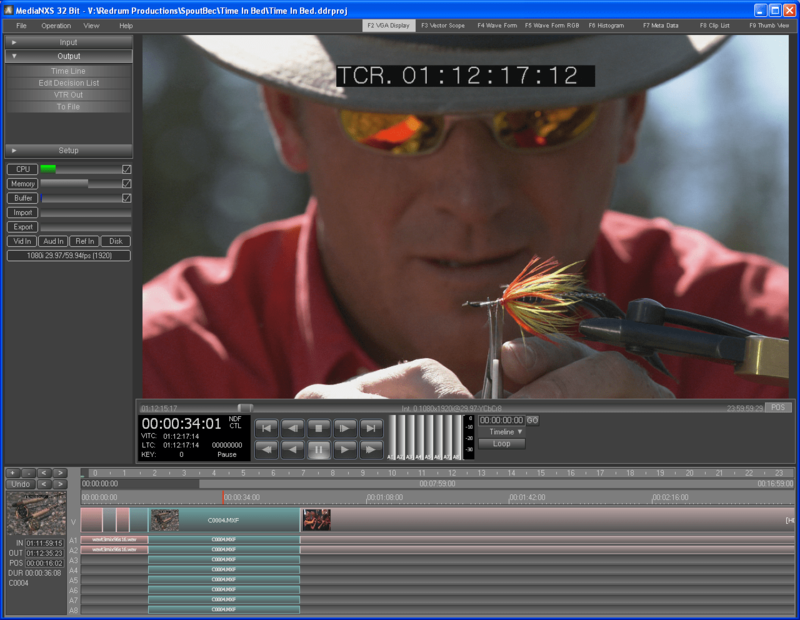 The clip may be duplicated to provide multiple instances for editing. The clip may be exported to various formats for delivery or alternate output. For all records, the metadata set is embedded into the media file where possible, and also stored in a sidebar XML file so that no information is lost. Metadata may be displayed for any loaded clip by selecting the Metadata View tab. Metadata may also be accessed for a clip which has not been loaded. In Thumbs view, the user may right click on any clip's picon and select Metadata from the context menu. In Clips view the user may scroll to any clip and click on the word 'Metadata' to see the clip's metadata. Over a hundred metadata elements are maintained so any information that has been properly set will be accessible. MediaNXS projects maintain a cuts-only conform that may be viewed as a timeline or a traditional EDL (edit decision list). Clips may be added dynamically from the Thumbs view or Clip list. An Add dialog is available for clips not in the Clip list. Clips are displayed on the timeline as a set of tracks, each of which display the track name. A picon is displayed for quick visual reference. 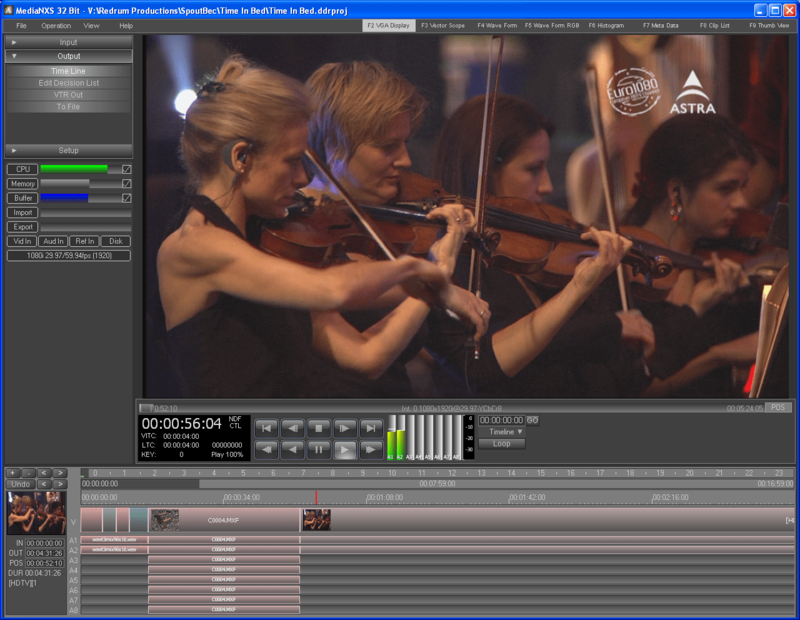 Selecting the clip loads its details to the left of the timeline and allows the user to edit the In/Out points (trim the clip) and clip position on the timeline. An undo button is provided to remedy an incorrect action on the timeline. 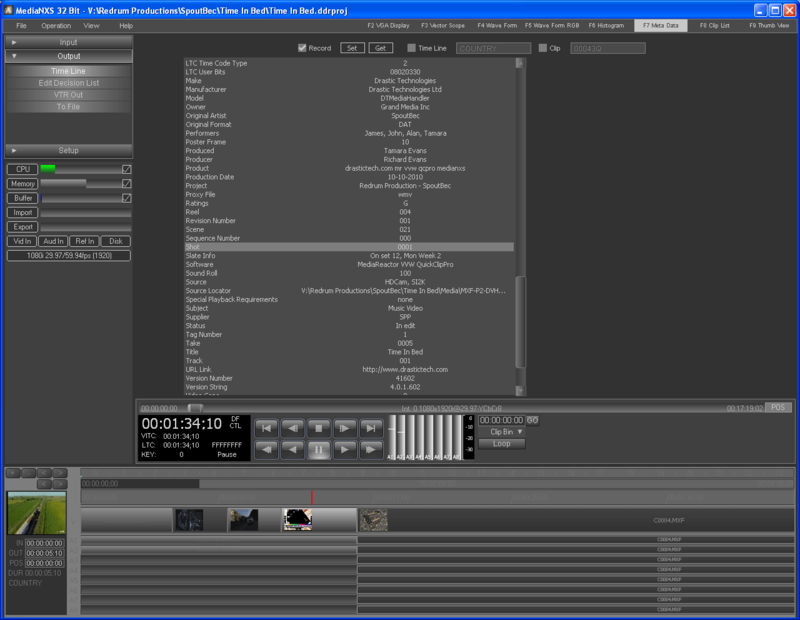 The timeline also provides the basis of the 'To VTR' direct to tape output as well as the file export. Timelines can be quickly generated by dragging and dropping clips onto the timeline, then moving them into place, and trimming as needed. Fine tuning of the timeline can be done in the time code edit boxes to the right of the timeline, making frame accurate changes a snap. When in the EDL view, all time code positions are editable in place, for maximum convenience. Clips are displayed on the EDL as a row whose columns detail the parameters of the clip, such as the In/Out, Position, Path, Comment. Selecting a clip loads its details and allows the user to edit the In/Out points (trim the clip) and clip position in the EDL. Control an external VTR for frame accurate EDL based pull-ins and multiclip timeline based laybacks. Automatically create timelines through EDL batch capture. Exchange and edit timeline components for multiple distributables. Lay back the timeline in one pass and export a matching EDL. Preview individual edits or the whole EDL before running it. Adjusting edits is simple and non-destructive. Multiple lists may be saved whether they reference the same media or different media pools. MediaNXS supports a wide range of standard EDL types so lists may be saved in the user's preferred format for ease of access and compatibility. There is a slave mode 9 pin serial control option available for MediaNXS, which allows standard controllers and automation systems to start and stop recording, bump edit, play out files and playlists, and review and create clips remotely. This option provides for seamless integration into an automated environment. 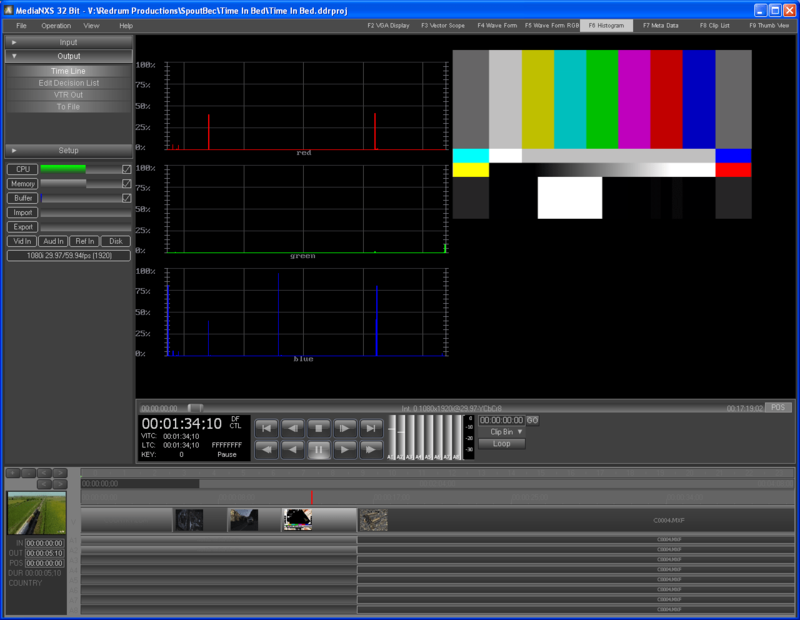 Built into MediaNXS are preview, vectorscope, waveform YCbCr, waveform RGB and histogram displays. Single link or dual link (hardware-dependent), RGB or YCbCr and file monitoring are supported. These signal analysis and measurement tools provide a general reference to confirm input and playback signal levels, color balance and other information. View the black and white levels, luminance, and chrominance, with alarms. Also view both chroma and luma using Drastic’s vectorscope and exclusive “Luma Stick”! Each of these signal analysis and review screens sits next to a scaled down VGA display of the clip (black & white for the waveform monitor) with dynamic features. Grabbing the VGA screen and pulling to the left or right will scroll through the clip at a rate relative to the speed of the user's action. Double clicking on the VGA toggles between cueing the first and last frame of the clip. MediaNXS not only supports physical I/O, it also provides transcoding from and to formats used by your digital intermediate software. Direct support for the formats used in Smoke/Flame, Assimilate Scratch, Nuke, Final Cut Pro, Avid editors, Premiere Pro, Digital Fusion, After Effects, Shake, Motion, Combustion and many more. MediaNXS creates both compressed and uncompressed files that are supported directly by these applications. This means no extra steps in moving media between your editing, graphics, color grading and CGI tools and the real world, from creation to delivery. MediaNXS supports recording directy to OpenMXF, which allows other applications, like Adobe Premiere, Avid MediaComposer and most players, to play the file while it is still recording. 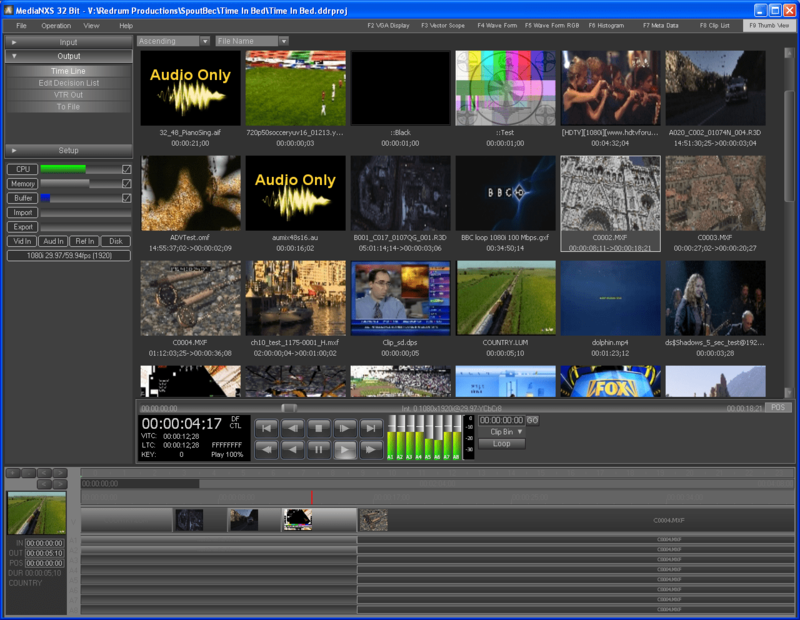 MediaNXS also supports the RTIN real time index format, that can be used with plugins to allow edit while recording in Adobe Premiere, Avid MediaComposer, Assimilate Scratch, Digital Vision NuCoda and AutoDesk Flame/Smoke, while recording standard file formats like MXF, MOV, AVI and YUV. 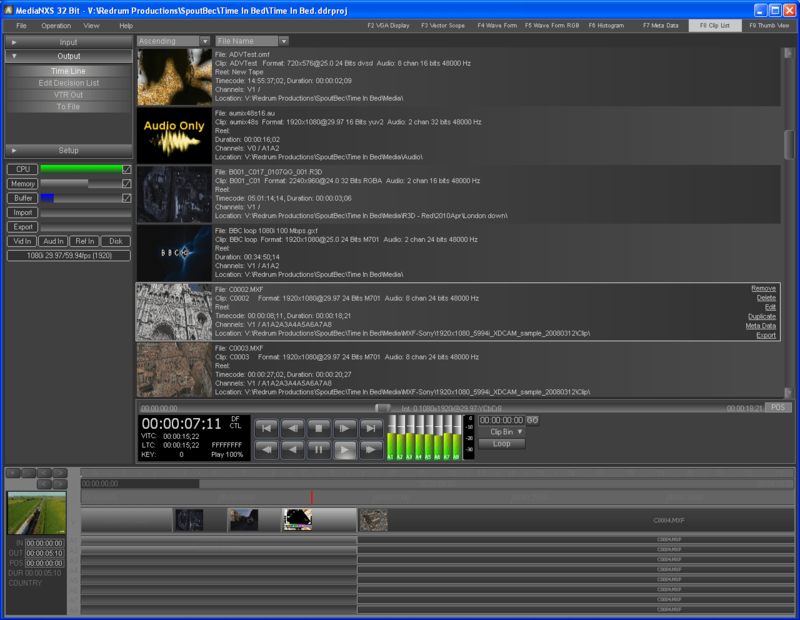 videoQC can be used with both OpenMXF and RTIN workflows to check and clip files as they are being recorded. Video/Audio specifications below are hardware dependent, please confirm specific capabilities with the video board's documentation. Additional system resources may be required to work with certain file types, including as noted below. Windows OS (XP->7, 32 or 64 bit), 100 megabytes available on program drive, 1280x1024 GPU (AMD/NVidia recommended), 2 Gigabyte RAM, 2.4 GHz processor (Quad 3.0 GHz for DVHD/MPEG2-100), RAID storage for uncompressed (local or network storage for compressed playback). MediaNXS LE (limited edition) is $99.00 US. 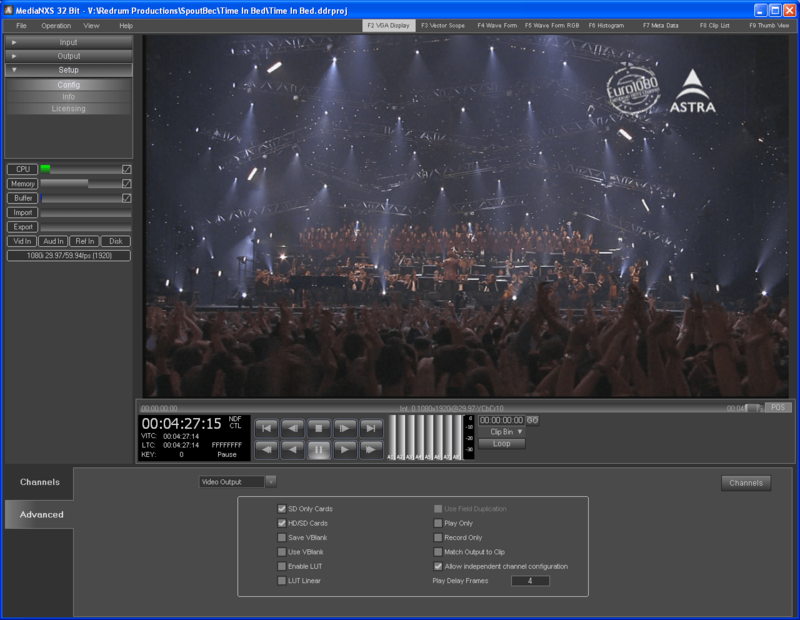 MediaNXS LE offers a basic set of capture and playback tools for some of the most commonly used file formats. 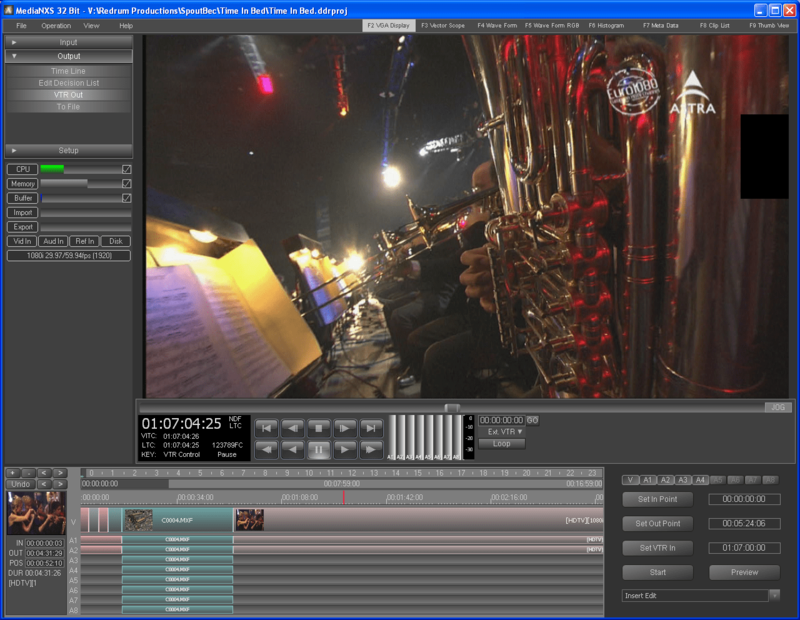 Supported formats are MOV, AVI, YUV, TIFF, TGA and DPX files in uncompressed SD and HD formats. MediaNXS HD is $295.00 US. MediaNXS HD provides Drastic's complete range of file format and color space support including compressed formats like MPEG, AVCHD and MXF, along with closed caption playback, and import/export capability. MediaNXS 4K is $895.00 US. MediaNXS 4K is designed for digital cinema, production and broadcast applications, and adds support for 4K (both 4096 and 3840), MPG, MP4, DVHD, ProRes (play only), 3D, Raw Camera (LMP, Arri, Weisscam) and closed caption playback and recording. Control Option is $995.00 US, and provides operation under TCPIP, HTTP or RS-422 9-pin serial control. This option is available for MediaNXS 4K only. SyncControlPro Option is $3,695.00 US, and provides synchronized start and stop of capture and playback on multiple Control Option enabled MediaNXS 4K systems. *CineForm Option is $200.00 US. 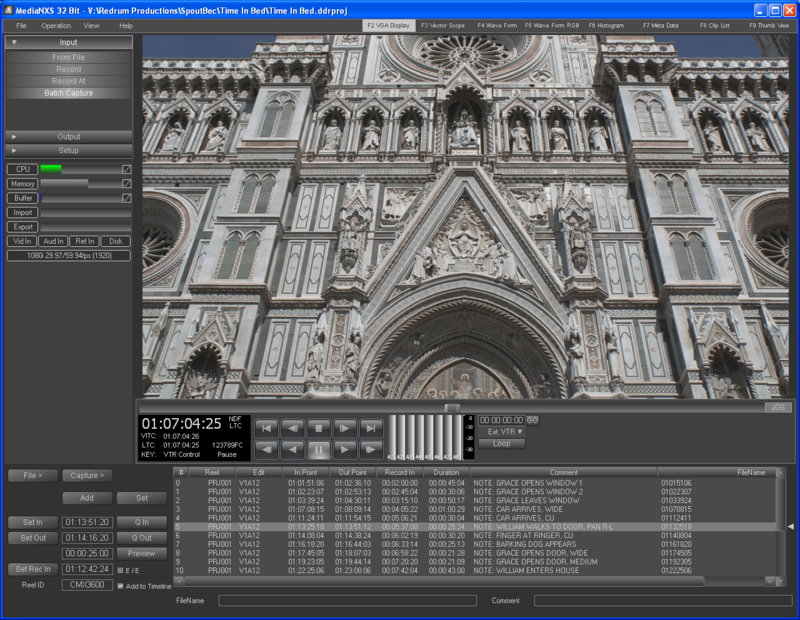 CineForm and CIneForm3D playback/import (read) is included in MediaNXS. The option adds support for record/export (write). **JPEG2000 Option is $250.00 US. JPEG2000 playback/import/export (read and write non-real time) is included in MediaNXS. The option adds support for high speed (real time for DDRs) record. Please note: MediaNXS requires specific drivers and firmware versions to operate correctly. 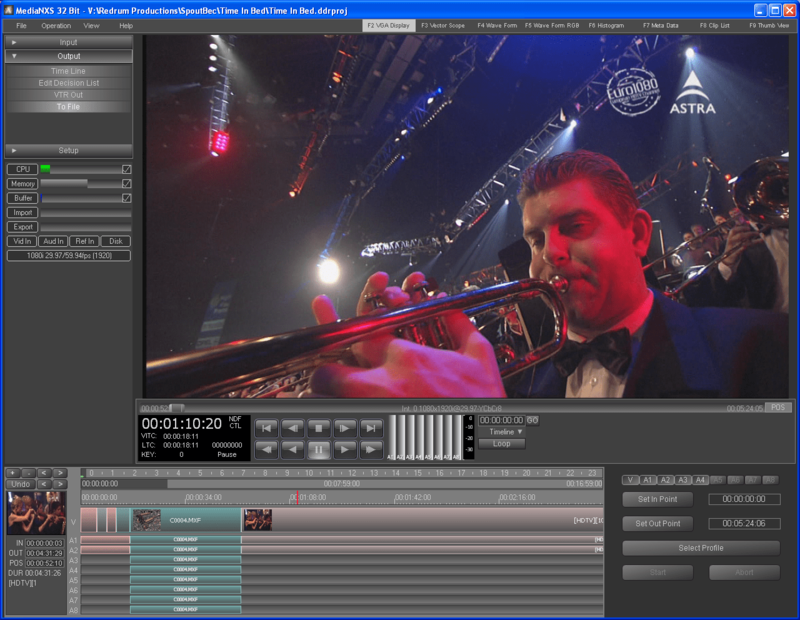 MediaNXS is compatible with Windows 7 or greater For HD-SDI output on OS-X, please see videoQC.